Berwick suffered their third successive home league defeat when Shielfield specialists Edinburgh hammered another nail into the Bandits’ play-off hopes. The reigning champions and current leaders dominated from start to finish and superior gating meant they provided the first eight race winners, a handicap from which the home side were never able to recover. During that spell the Monarchs had six different race winners in guests Richie Worrall and Liam Carr, along with Kevin Wolbert (twice), Craig Cook (twice), Justin Sedgmen and Max Clegg, which proved this was a victory down to a real team effort. At 17-33 Edinburg were well and truly in the driving seat and although Bandits bounced back to provide three race winners of their own in Thomas Jorgensen (9), guest Rohan Tungate (10) and skipper Kevin Doolan (11), it was obvious they were always fighting a losing battle. At times Berwick could not be faulted for their lack of effort. In heat eight Fernando Garcia chased Clegg all the way to the line before falling coming off the last bend. Two races later he cut up the inside of the previously unbeaten Wolbert and in 11 Doolan produced the ride of the night when he stormed from third to first, passing both Sedgmen and Worrall in the process. By the end of heat 12 Berwick needed three 5-1s just to earn a draw, so when Cook won his third race in 13 the Monarchs were in an unassailable position. Jorgensen won in 14 but Cook, who had dropped his only point to Jorgensen in nine, finished with a flourish with a pass up the back straight as the capital side left with maximum points. The meeting marked the debut of Mathias Thörnblom for Berwick, and he looked on the pace for his three points, but like most of his team-mates was beaten out of the starts. 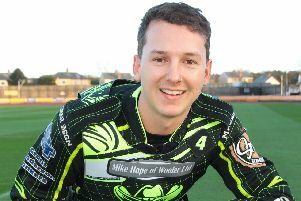 A feature for Edinburgh was also the form shown by Berwick’s own Liam Carr, riding as a guest, who scored a very creditable paid nine at reserve. Berwick Bandits: Doolan 11, Jorgensen 10, Tungate 6+1, Hall 3+2, Garcia 3, Thomblom 3, Edberg 2. Edinburgh Monarchs: Cook 14, Wolbert 10, Worrall 8+1, Carr 7+2, Riss 7+1, Sedgmen 4+1, Clegg 4.